Molluscum Contagiosum is many families dirty little secret. This infection is extremely common and a childhood right of passage. Despite its high prevalence, most parents have never heard of it. The rash typically consists of 2 to 30 flesh colored, domed shaped papules (bumps). They are typically 2 to 3 mm, but range in size from 1 to 5 mm. They are often located on the inner thigh or side of the torso. Molluscum is caused by a pox virus - mulluscipoxvirus. It is spread through direct contact and can be carried on unwashed clothing or towels. When my older boys brought this home every Gordon kid was given a designated towel bar. The incubation period (time from exposure to symptoms) is 2 to 7 weeks. Molluscum contagiosum is worse when children have dry skin conditions like eczema. This virus will spread on dry skin like a wildfire in a dry forest. Often the best treatment is good skin hygiene. Regular lotion for those with dry skin and minimizing habits like picking skin. While many doctors will pop, cut, freeze, and medicate these lesions, there are no approved therapies for typical cases of molluscum. The average case self resolves after 18 months. 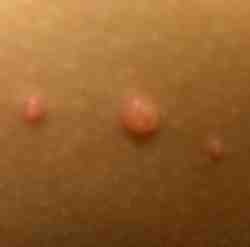 Individual bumps often become red and more swollen (like a pimple) as they go away. The bumps rarely bother the child, but drive many parents nuts.